We have been plodding along as a family for the last few weeks. Axel is doing well – still very noisy while breathing but he is still happy which helps us get through it. The oxygen and the floppy airway are definitely harder for Ian and I than it is for him which is comforting. Despite the oxygen and the extra steps it takes to do everything, Axel, Juniper and I have been enjoying Chariot runs in between snow storms. 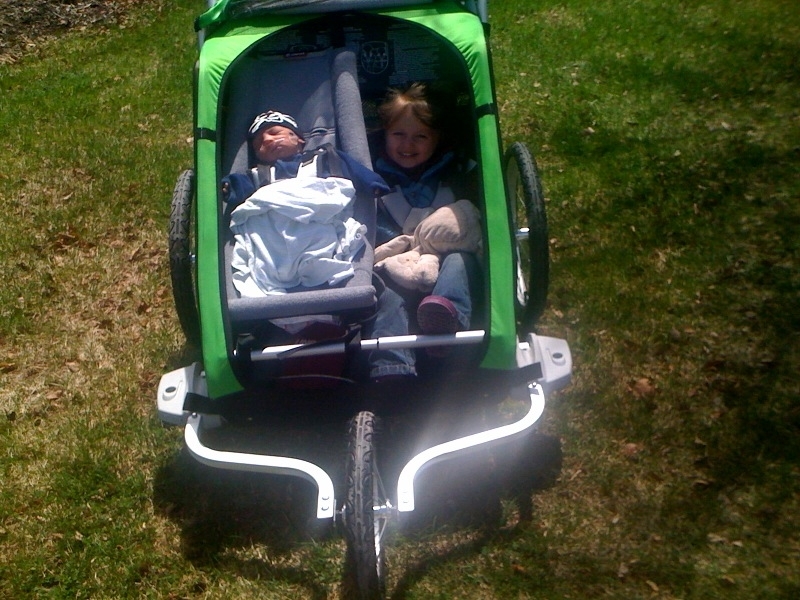 Juniper has been asking to go running so she can hang in the Chariot with Axel. This has really helped me to get out the door and motivate. By the way, here are more things to make an active mother’s life way much easier – babyiDesign.com. Having my mother-in-law in town allowed Ian and I to get out for another road ride together this weekend. I still don’t seem to have any climbing legs but am not sure I’m ready for hill repeats to get them back. It has been almost five weeks since Axel was born and I’m starting to feel like I can really put a good hard effort in including a two hour trail run and some intervals on the trainer (we’ve had lots of snow recently). Although it’s not happening as fast as I would like, my fitness is starting to improve as well as my patience and coping skills from lugging the oxygen around.